Sporting “Out in the Lineup” shirt at the AFL’s first ever Pride Match! The AFL says it wants to start a conversation about discrimination against LGBTI people at its first pride match. The game between St Kilda and Sydney was played last Saturday night where goal umpires waved rainbow flags. 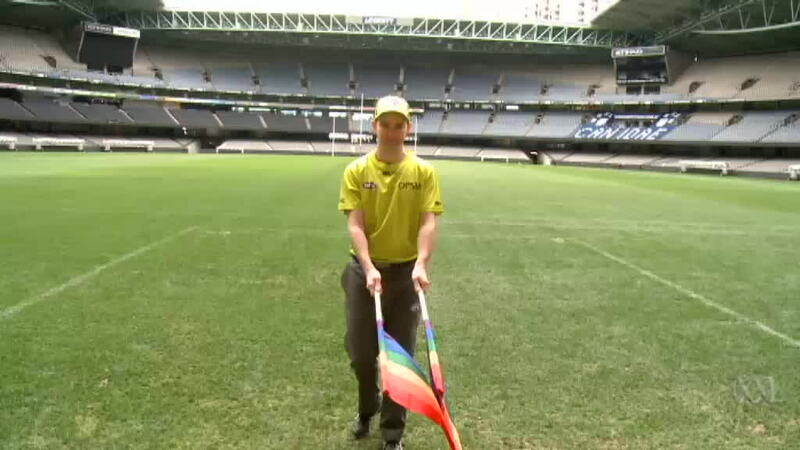 GIF: A goal umpire waves rainbow flags ahead of the game. 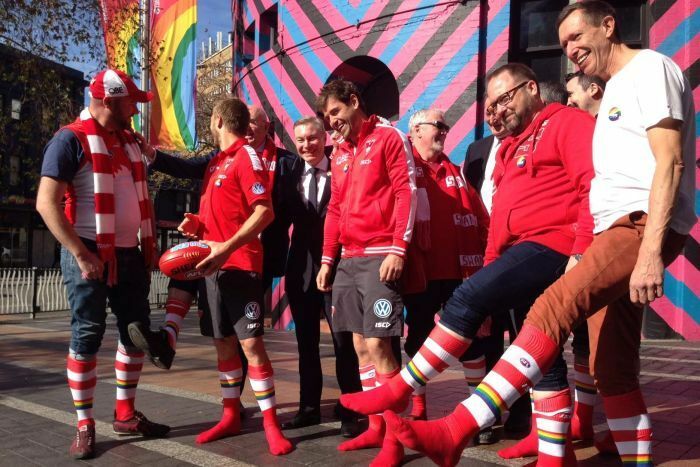 St Kilda players will wear guernseys with rainbow-coloured numbers for the match, while the Swans will wear rainbow–coloured socks. AFL chief executive Gillon McLachlan said he wanted footy goers to be able to be who they were. “We’re not trying to be the social leader on everything, but issues come up from time to time that we need to lead on and this is one of them,” he said. “We’re not going to solve anything through this one game. Some will be outraged and some will applaud it. St Kilda chief executive Matt Finnis, who raised a rainbow flag at AFL House on Tuesday, said it was an important issue. “It’s a historic moment, not just in AFL but in world sport,” he said. Mr Finnis said the club was inspired to support the round after Jason Ball became the first Australian rules player, while at Yarra Valley Mountain District league, to come out as gay in 2012. “We saw the way in which a country town got behind that game and really started having a conversation about things that perhaps were a little unspoken,” he said. “The unfortunate reality is the LGBTI community haven’t felt welcome at sport or at the footy. Sydney Swans chairman Andrew Pridham said the club was proud to be involved. “Statistically there are gay football players playing AFL. We just have to create the environment that they feel comfortable in,” he said. Beyond Blue chairman Jeff Kennett said the pride game was about reducing discrimination. “This I see as a genuine attempt to increase the way in which we relate to each other for better and to lower the incidence of discrimination,” he said.